The Indianapolis Newspaper Guild has won pay raises for most of its workers but was unable to stop The Indianapolis Star’s plans for outsourcing, which could ship up to eight jobs out the state. The Guild’s contract negotiating team reached a tentative agreement Thursday with representatives of The Indianapolis Star in a deal which must still be ratified in a vote by the Guild’s membership. The agreement was the definition of a compromise. In an industry still cutting jobs and cutting pay, the deal would award the Guild’s workers raises of 2 to 4 percent, with the highest raises going to some of the Guild’s lowest paid workers. But it was only a small step toward restoring the 10 percent pay cuts the Guild took two years ago. Despite making it a focal point of the Guild’s “Save the Star” campaign, the Guild’s team found that outsourcing the page design work was an area where The Star was unyielding. We made a strong case — in leafletting efforts, a street protest, a media campaign and at the bargaining table — that this could damage the local news product. But it became clear that this was an edict from Gannett, The Star’s parent company, and that the quality of the product was a secondary consideration to saving money. The Guild knew this was an uphill battle going in. We were told this was one we couldn’t win. But we felt it was worth trying. And if Gannett attempts future outsourcing in Indianapolis, they can be assured we will wage an even more ardent campaign to resist such an effort. At present, The Star hasn’t specified exactly what pages will be designed in Louisville or how many journalists in Indianapolis will be displaced. The last estimate we were given was six to eight. The pay raises, while not fully restoring our 10 percent cuts from two years ago, were significant. Our industry is still in job and pay cutting mode. And newspaper unions around the country are still facing cuts such as the ones we took two years ago. That we could squeeze out even these modest raises was a testimony the efforts of our workers and our friends in the community and the breadth of our public campaign. 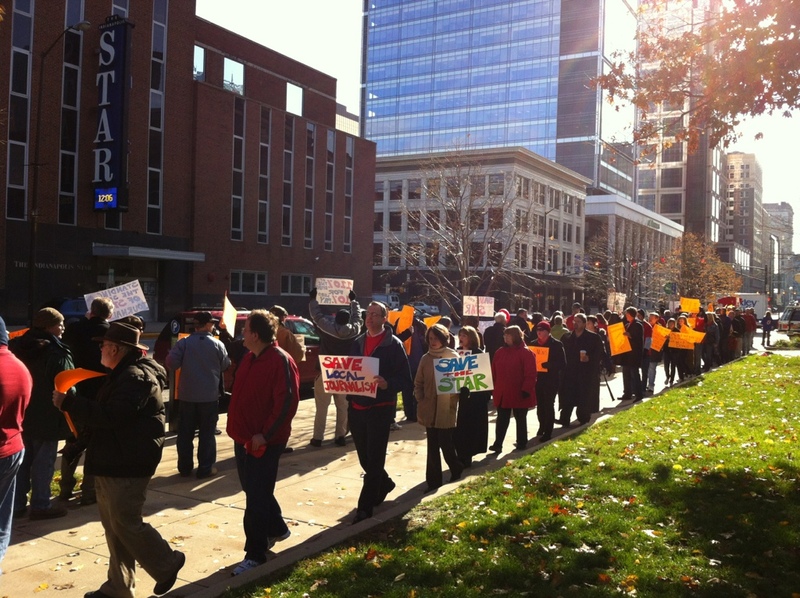 The Guild, with financial help from the Communications Workers of America, purchased five billboards, ran three months of messaging on public radio, handed out more than 5,000 leaflets in Downtown locations and staged a protest/rally in front of The Star in November that was a first in the Guild’s history. More importantly, we engaged people from the community in our cause. We received calls, emails, letters and thousands of page views on SavetheStar.com. Leaders of the faith community — Jewish, Christian, Muslim and others — confronted The Star’s executives about the inequity of our pay cuts at a time of multimillion dollar bonus among Gannett’s executives. Those faith leaders also took a stand about the importance of a local newspaper being produced locally. For that, we will always be grateful. The Guild’s ratification vote will take place next month. While this round of bargaining is over, we remain committed to preserving quality journalism in Indianapolis. We will continue to resist any attempts to diminish that quality. We will continue our efforts to Save the Star. http://www.facebook.com/indynewsguild to watch the videos. Thousands of commuters at 16th and Delaware getting their chance to learn more about our Save The Star campaign. 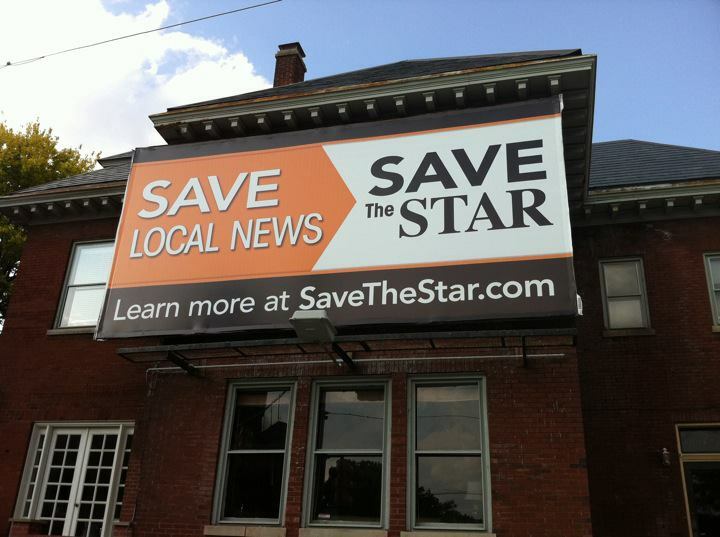 Learn more about the billboard and our Save The Star campaign.